Coal mining companies deny the existence of technology that cuts the amount of coal needed to produce electricity. Pakistan's first coal gasification plant will start generating low cost electricity from next year. "The renowned scientist Dr. Samar Mubarakmand who is head of the Thar Coal Gasification Project ... was participating and Chairing the Clean Coal conference held here on October 23 and 24 to mark the World Clean Coal Week." By utilizing gasification technology, brown coal, which until now has been regarded as unfit for coal-fired thermal power, will become a promising resource. By introducing Japanese gasification technology to Mongolia, your vast resources of brown coal dormant in the ground of Mongolia will become a treasure trove." "Integrated coal Gasification Combined Cycle (IGCC) is a coal-based power generation technology that achieves the twin objectives of reduced CO2 emissions and increased efficiency by "gasifying" the coal and then using a gas turbine and a steam turbine in a two-stage generation process. MHI has been researching and developing this technology since the 1980s. It has accumulated numerous proprietary technologies and demonstrated their reliability primarily with test operations at an enormous IGCC demonstration plant. The demonstration plant quite successfully finished the test operations, satisfying all targets set. With its capabilities highly evaluated through the series of test operations, the decision was made to convert it to a commercial plant owned by a utility company and to commence commercial operations in June 2013. This marks the long-awaited practical application of a pioneering technology that will open a new era for the effective use of coal. MHI has committed every possible technology towards the pursuit of the IGCC plant's efficiency. As well as combining gas and steam turbines with a highly efficient energy-converting gasifier, MHI also makes use of the discharged heat to avoid waste. This mechanism delivers 10-15 percent better thermal efficiency than a state-of-the-art coal-fired conventional thermal power plant (ultra-supercritical coal-fired thermal power plant: USC). Because it can provide the same amount of power as a USC but using less fuel, it also cuts CO2 emissions by about 10-15 percent. This puts it on a par with oil-fired thermal power plants in terms of emissions. 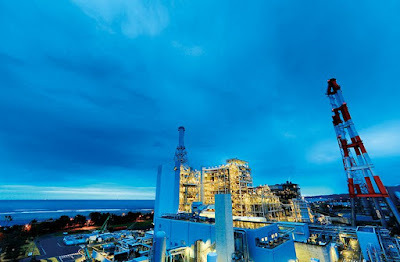 The IGCC plant is a complex system that combines a gasifier, a gas turbine, a steam turbine and other interconnected equipment. It is a testimony to MHI's advanced design and engineering skills that the plant succeeds in harnessing them together into an efficient and reliable working unit. Within just a year of its start, the Nakoso demonstration plant had racked up 2,238 hours of continuous operation. This unparalleled achievement owes its speedy progress to the smooth interaction of the plant's various equipment. IGCC is expected to spawn new technologies in the future. There is a real prospect of a MHI power plant achieving thermal efficiency of over 65 percent when it launches the J-Series gas turbine"